A double sandwich immunoassay for human C-reactive protein. A kit for research used. Not intended for diagnostic purposes. Contains one microwell plate and sufficient materials to test up to 84 test specimens. The 96-well plate comprises 8 well strips for flexibility in the number of samples run in each assay. The Kalon High Sensitivity CRP assay (hs-CRP ELISA) is an enzyme-linked immunosorbant assay (ELISA) kit based on the ubiquitous 96-well microplate so that CRP levels can be conveniently determined in a normal laboratory without the need for a large clinical chemistry analyser. This assay is therefore a convenient way to measure CRP levels in plasma and serum samples for research studies. The assay is based on the double antibody sandwich format with an alkaline phosphatase enzyme tracer. To run an assay the unknown serum samples and quality-control samples must be diluted in the diluent buffer provided. A dilution of 1/1000 is both appropriate and convenient for the majority of samples lying in the range from 1 to 50 mg/L but the assay will accommodate a very wide range in sample dilution. For example, a dilution anywhere from 1/20 to 1/400,000 can be used be used to bring a sample onto the best range of the standard curve. CRP Calibrators are supplied ready-to-use and do not require any further dilution. 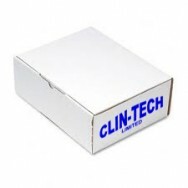 The microplate is supplied pre-coated with affinity purified anti-CRP antibodies. CRP calibrators, diluted samples and controls are added to the microtitre wells and incubated at ambient temperature for 1 hour and then washed. The tracer (affinity purified anti-CRP enzyme conjugate) is next added to the wells which are incubated for another 1 hour and then washed. A chromogenic enzyme substrate solution is added to the wells and incubated at ambient temperature. After 30 minutes the enzyme reaction is stopped by the addition of a “stop solution.” The optical density of the chromogen in each microwell is then read in a microplate photometer. The photometer should be set to read the optical density at 405 nm, which is the OD max for para-nitro-phenol phosphate. The amount of colour produced in each well is dependent on the amount of enzyme attached to the microtitre well which relates to the level of CRP in the original sample. The optical density of each CRP calibrator (standard) should be used to construct a standard curve. It is recommended to fit the data to the 4-parameter logistic equation by means of curve fitting software. Next the level of the quality control samples should be determined. The information gathered so far should be used to determine whether the assay is valid. Provided this is the case, the CRP level in the unknown samples can be calculated. To do this the CRP concentration of the diluted sample in each well is first read off the standard curve. Next, this level is corrected for the sample dilution prepared to find the CRP level in the original sample. Finally, the mean (average) level for the sample is calculated from any sample replicates run in the assay.